Four days to explore. 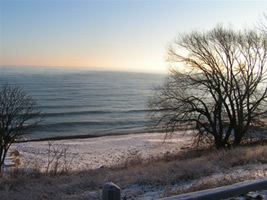 create and relax on the beautiful shores of Lake Michigan. Talk to Roberta Dahmer if you only want to stay Monday thru Wednesday. wonderfully inspirational site to rev up your creativity. Deposit: $50 required with your registration. Make checks payable to “Siena Retreat Center” and mail with registration to Roberta Dahmer, 1660 Hilda Drive, Sandwich, IL 60548. Total Cost: Approximately $285 for the 4 days (Siena has a rate change as of Sept. 1st so I am guessing what the increase will be.) AS SOON AS SISTER DOLORES NOTIFIES ME, I WILL GIVE YOU THE CORRECT COST. This includes 3 nights and 8 meals, room w/ bath, and use of a multi-purpose room with $6.00 included in the cost above for your table rental. If anyone wants an additional table, it will cost another $6.00. Again, make checks payable to “Siena Retreat Center.”. Talk to Roberta Dahmer if you only want to stay Monday thru Wednesday. Open to all PAQA members. We have spaces for 5 - 6 people. IF YOU HAVE SOMETHING YOU WOULD LIKE DEMOED PLEASE LET ROBERTA KNOW AT robertad1@comcast.net or 815-498-2604. Make check out to: SIENA RETREAT CENTER and MAIL WITH REGISTRATION FORM ABOVE TO: ROBERTA DAHMER, 1660 HILDA DRIVE, SANDWICH, IL 60548.